The Future of Retail is ‘Here’ and ‘Now’ - What's going on in Retailing?! To remain competitive in today’s real-time world, retailersneed to more effectively read and respond to consumers’digital fingerprints, or Code Halos, to anticipate theirpreferences and needs and deliver contextually-relevant,timely and inspiring shopping experiences. In the workplace and our personal lives, many of us operate in real-time. Thanks to the proliferation of mobile devices, we don’t need to makefirm plans — we can notify each other of changes right up until the timewe meet. As consumers, we don’t have to wait for delivery — we canorder an item in the morning and pick it up at lunchtime in the store. Inmany future-ready workplaces, we receive text alerts for key updatesrather than waiting for a weekly or daily report. What is less understood is that we also operate “contextually.” In a worldof social media status updates, as well as geospatial capabilities andlocation apps, we tailor our communications based on where peopleare, what they are doing and even how they are feeling. Consumersincreasingly expect their interactions to take into account their location,their current needs, their last transaction and their life situation. Forinstance, they might expect to receive a coupon on their mobile devicebecause it’s 9:00 a.m., and they always buy coffee at this particularcafé at this time. Or they might believe their music Web site shouldautomatically select soothing music on their commute home because itcan sense traffic volume rising. While some of these scenarios might seem futuristic, the fact remainsthat retailers should begin now — if they haven’t already — to respondto consumer expectations for real-time, relevant, omni-channel andcontextual experiences. To do that, retailers need to extend their understanding of how to usethe digital information that’s available to them from not only consumers,but also products, processes, employees, “things” and the enterprise.These digital footprints — or Code Halos — are increasingly critical togaining the insights needed to create differentiated value for customersand remain competitive in the digital economy. This is a full-companyeffort in which businesses need to collect and analyze customer information, discover correlations and insights, combine these insightswith other Code Halos, share these insights throughout the companyand develop an engaging consumer experience across channels. 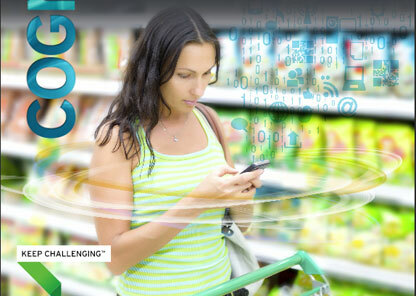 This whitepaper discusses how retailers can shift into Code Halo™thinking and develop a competitive edge by offering contextual andrelevant experiences for customers. We describe how a reliable CodeHalo infrastructure can be deployed, based on technology from SAP,combined with social, mobile, analytics and cloud technologies (theSMAC Stack™), to take real-time, contextually-sensitive thinking fromconcept to reality.